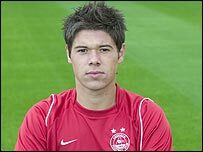 St Johnstone have taken midfielder Jamie Winter on loan from Aberdeen until the end of the season. The Perth side have also released Steven McManus, who will join Montrose, and cancelled the contract of goalkeeper Mark Paston. "Jamie is here on the understanding that he will definitely be returning to Pittodrie in the summer," Saints boss Owen Coyle told the club website. "At 20 Jamie is at a great age and he will definitely enhance our side." Winter signed a two-and-a-half year deal with Aberdeen last November after agreeing a switch from Leeds United. He has made just five starts this season but the Dons have high hopes for him. "I tried to sign him when I first came to the club but it was clear that Jimmy Calderwood at Aberdeen rates him very highly," added Coyle. "I had to pester Jimmy over a long period of time to get him to allow Jamie to come here but he agrees that it would be best for Jamie to play week in, week out for a spell." The release of Paston may clear the way for Matt Glennon to move from Falkirk to McDiarmid Park.